Nearly everyone agrees that innovation is the way to supercharge an organisation to growth. The right workspaces can help make it happen. Today nearly everyone agrees that innovation is the only way to supercharge an organisation and shift it to growth. The ability to see new opportunities and harness resources to pursue them is a fundamental advantage for any organisation, from super corporations to start-ups. But many are uncertain about just how to make innovation happen, especially when the pressure to stay skinny and do more with less remains strong. Management wants to get the most out of every effort and avoid dead-ends, and by definition innovation is never a sure thing. 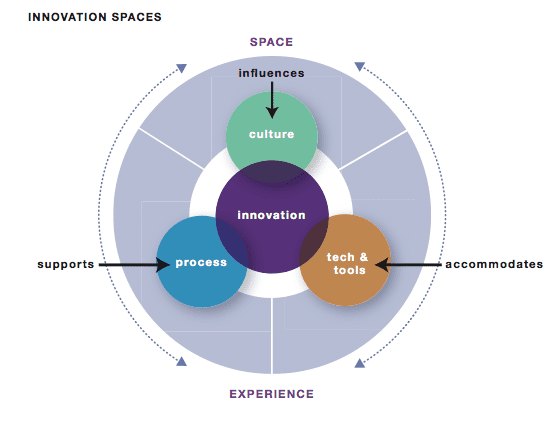 At the same time, thanks to advances in the social sciences and the growing influence of design thinking as a problem-solving methodology, more knowledge is available than ever before about how to incubate innovation and assure it flourishes.